For TrulyRichClub members, I usually advise them to just open an EIP Starter account with COL Financial even if their initial investment is over 25k. Why? Coz they’re not active traders but mostly investors who spend a little than an hour each month buying stocks. The EIP Plus Account of COL gives a more dynamic homepage with streaming quotes and all that we, TRC members, don’t necessarily need. This is an entry-level account suitable for long term investing. It provides access to basic research reports, standard market information, and end-of-day charting data. The minimum investment under this type is Php5,000. This type of account is for active traders. It provides streaming quotes, comprehensive research reports and live chart data with some customizable features. This is a strong featured trading account catering to those needy of more research as well as faster data streaming. 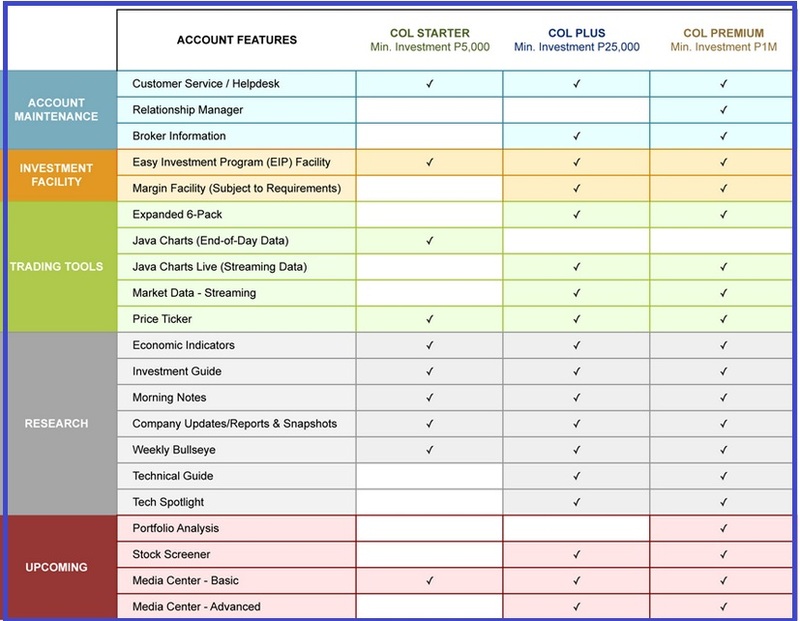 It has all the features of the COL Starter account with addition to some feature improvements like streaming data over your Quote page, Watch list, an expanded 6-pack, detailed broker information, more research, as well as Java Charts with live data. It also has usage of COL’s Easy Investment Program or EIP to schedule purchase orders for your favorite stocks. The minimum investment under this type is Php25,000. This is a fully packed COL account, with open access to all website features and functionalities, that is administered with quality service. This account is automatically hosted into our best servers using first class technology to support faster operation. Each account holder will also be assigned a Relationship Manager (RM) whose function would be to act as a concierge in carrying out necessary requests and needs from our premium customers. The minimum investment under this type is Php1,000,000. *NOTE: During COL’s beta test period, all account services/features will be available for customer use. The beta test phase will formally end in April 2013 after which certain account features will only be available depending on your account type. P.S. COL Financial, Inc. is the recommended Stock Broker of Bro. Bo Sanchez to all his TrulyRichClub members. The TrulyRichClub is a membership Club that he had created to help people achieve Financial Wealth and Spiritual Abundance. It is a private group of individuals who have decided to do something about changing their beliefs and thinking—to gain the abundance mentality they need to change their lives forever. Bro. Bo provides them with the right tools, principles, and strategies to grow in their financial and spiritual life. I would like to ask the name and address of the point person in COL where I can email my scanned filled out COL forms. Hi Vicky. Pls read ‘How to Open a COL Account’ here. COL’s address is on the form itself. hi does eip starter account has a maintaining balance needed? Hi joey i would like to ask how to apply for the COL financial account for the new member of truly rich club of Bo Sanchez. Thank you.. I’m looking forward for your reply. Email sent. There’s also my tutorial here on opening an account.